James Watt (January 19, 1736 – August 25, 1819) was a Scottish inventor and engineer whose improvements to the steam engine provided much of the impetus for the Industrial Revolution. His invention brought the engine out of remote coalfields and into factories, where work could be performed on large scales, almost year-round, with vastly higher efficiency. The steam engine was employed in the locomotive and steamboat, thus leading to the revolution in transportation. In addition, higher demands for precise machining led to a cascade of tools that were used to produce better machines. At the same time, Watt's steam engine focused attention on the processes of converting heat to mechanical work. It inspired Sadi Carnot's groundbreaking work on the efficiency of heat engines, leading to the development of the field of physics known as thermodynamics. A statue at the James Watt College building marks the site of his birthplace. Watt was born on January 19, 1736, in Greenock, a seaport on the Firth of Clyde, in Scotland. His grandfather was a surveying and navigation instructor, while his father manufactured nautical instruments and was a shipwright, shipowner, and contractor. Watt's mother, Agnes Muirhead, came from a distinguished family and was well-educated. Both his parents were Presbyterians. Watt attended school irregularly, primarily because he suffered from migraine headaches. Because of this infirmity, he received most of his schooling at home. Watt's father set up a small workbench for his son, who earnestly learned and practiced the skills of woodworking, metalworking, instrument making, and model making. He exhibited great manual dexterity and an aptitude for mathematics. When he was seventeen, his mother died and his father's health had begun to fail. Watt traveled to Glasgow and was apprenticed to an optician. He then headed for London on the advice of a friend, and studied instrument-making there for a year. Although he learned his trade, the unfavorable work environment strained his health and forced him to return to Scotland, where he convalesced. After his recovery, he attempted to establish himself as an instrument-maker in Glasgow. Despite there being no other mathematical instrument-makers in Scotland, the Glasgow Guild of Hammermen (any artisans using hammers) blocked his certification because he had not served at least seven years as an apprentice. Watt was saved from this impasse by professors at the University of Glasgow, who in 1757, offered him the opportunity to set up a small workshop within the university. One of the professors, the prominent physicist and chemist Joseph Black, became Watt's friend and mentor. In 1764, just as he was about to make a major improvement to the Newcomen engine, Watt married his cousin, Margaret Miller, with whom he would have five children, two of whom would survive to adulthood. Watt's first wife died in childbirth in 1773, and in 1776, he married his second wife, Ann MacGregor. Besides improving the steam engine, Watt took up other pursuits. In the 1880s, he experimented with the application of chlorine compounds to the bleaching process. He also was the first to propose the compound structure of water, although its constituent elements, oxygen and hydrogen, were not identified until years later, by French scientist Antoine Lavoisier. Watt was an enthusiastic inventor, with a fertile imagination that sometimes got in the way of finishing his works, because he could always see "just one more improvement." He was skilled with his hands and also able to perform systematic scientific measurements that could quantify the improvements he made and produce a greater understanding of the phenomenon he was working with. Watt was a gentleman, greatly respected by other prominent men of the Industrial Revolution. He was a fellow of the Royal Society of Edinburgh and the Royal Society of London, a member of the Batavian Society, and one of only eight Foreign Associates of the French Academy of Sciences. He was also an important member of the Lunar Society, and was a much sought after conversationalist and companion, always interested in expanding his horizons. He was a rather poor businessman, and especially hated bargaining and negotiating terms with those who sought to utilize the steam engine. Until he retired, he was always much concerned about his financial affairs, and was something of a worrier. His personal relationships with his friends and partners were always congenial and long-lasting. Watt retired in 1800, the same year that his partnership with Boulton expired, along with the patent rights to the steam engine. The famous partnership was transferred to the men's sons, James Watt, Jr. and Matthew Boulton. William Murdoch, a long-time employee of the firm, was made a partner, and the firm prospered. Watt continued to produce and patent other inventions before and during his semi-retirement. He invented a new method of measuring distances by telescope, a device for copying letters, improvements in the oil lamp, a steam mangle, and a machine for copying sculpture. He died in his home, "Heathfield," in Handsworth, Staffordshire, on August 25, 1819, at the age of 83. In 1761, four years after opening his workshop, Watt began to experiment with steam after his friend, Professor John Robison, called his attention to it. At this point, Watt had still never seen an operating steam engine, but he tried constructing a model. It failed to work satisfactorily, but he continued his experiments and began to read everything about steam that he could get his hands on. He independently discovered the importance of latent heat—the heat absorbed or released without a change in temperature when a substance moves among the states of solid, liquid, or gas—in understanding the engine. Unknown to Watt, Black had famously discovered the principle some years before. Watt learned that the university owned a model Newcomen engine, but it was in London for repairs. Named after its inventor, Thomas Newcomen, the Newcomen engine had been around since 1705, without being significantly improved, and had been applied with success to the removal of ground water from coal mines. The Newcomen engine worked by filling a piston chamber with steam, which would then be condensed by sprinkling cold water into the chamber. The condensing steam would produce a vacuum, which pulled the piston down. The downward movement pulled down one arm of a beam, the upward movement of the other arm of which would be connected to machinery, such as a pump to remove water from a coal mine. The process would be repeated, thus creating a repetitive see-saw action that moved the pivoted beam up and down. Watt convinced the university to have its broken model of the Newcomen engine returned, and made the repairs himself in 1763. It barely worked, and after much experimentation he showed that about eighty percent of the heat of the steam was consumed in heating the the piston cylinder. Watt's critical insight was to add a separate chamber, called the condenser, that was connected to the piston cylinder by a pipe. Condensation of the steam would occur in the condenser, thus allowing the temperature of the piston cylinder to be maintained at that of the injected steam and the heat loss minimized. In 1765, Watt produced his first working model based on this principle. Then came a long struggle to produce a full-scale engine. This required more capital, some of which came from Black. More substantial backing came from John Roebuck, the founder of the celebrated Carron Iron Works, near Falkirk, with whom he now formed a partnership. But the principal difficulty was in machining the piston and cylinder. Iron workers of the day were more like blacksmiths than machinists, so the results left much to be desired. Much capital was spent in pursuing the ground-breaking patent, which in those days required an act of parliament. Strapped for resources, Watt was forced to take up employment as a civil engineer in 1866, work he would do for eight years until more capital to develop and manufacture his inventions became available. In 1767, Watt traveled to London to secure the patent on his new invention, which was granted in 1769. In the meantime, Roebuck went bankrupt, and Matthew Boulton, who owned the Soho foundry works near Birmingham, acquired his patent rights. Watt and Boulton formed a hugely successful partnership which lasted for the next twenty-five years. During this period, Watt finally had access to some of the best iron workers in the world. The problem of manufacturing a large cylinder with a tightly fitting piston was solved by John Wilkinson, who had developed precision boring techniques for cannon-making at Bersham, near Wrexham, North Wales. Finally, in 1776, the first engines were installed and working in commercial enterprises. These first engines were used for pumps and produced only reciprocating motion. Orders began to pour in, and for the next five years Watt was very busy installing more engines, mostly in Cornwall, for pumping water out of mines. The field of application of the improved steam engine was greatly widened only after Boulton urged Watt to convert the reciprocating motion of the piston to produce rotational power for grinding, weaving, and milling. Although a crank seemed the logical and obvious solution to the conversion, Watt and Boulton were stymied by a patent for this, whose holder, John Steed, and associates proposed to cross-license the external condenser. Watt adamantly opposed this, and they circumvented the patent with their sun and planet gear in 1781. Over the next six years, Watt made a number of other improvements and modifications to the steam engine. A double acting engine, in which the steam acted alternately on the two sides of the piston was one. A throttle valve to control the power of the engine, and a centrifugal governor to keep it from "running away" were very important. He described methods for working the steam expansively. A compound engine, which connected two or more engines was described. Two more patents were granted for these in 1781 and 1782. Numerous other improvements that made for easier manufacture and installation were continually implemented. One of these included the use of the steam indicator, which produced an informative plot of the pressure in the cylinder against its volume, which he kept as a trade secret. These improvements taken together produced an engine which was about five times as efficient in its use of fuel as the Newcomen engine. Because of the danger of exploding boilers and the ongoing issues with leaks, Watt was opposed at first to the use of high pressure steam. Essentially, all of his engines used steam at near atmospheric pressure. In 1794, the partners established Boulton and Watt, to exclusively manufacture steam engines. By 1824, it had produced 1164 steam engines. Boulton proved to be an excellent businessman, and both men eventually made fortunes. As with many major inventions, there is some dispute as to whether Watt was the original, sole inventor of some of the numerous inventions he patented. There is no dispute, however, that he was the sole inventor of his most important invention, the separate condenser. But it was his practice (from around the 1780s) to preempt others' ideas that were known to him by filing patents with the intention of securing credit for the invention for himself, and ensuring that no one else was able to practice it. Some argue that his prohibitions on his employee, William Murdoch, from working with high pressure steam on his steam locomotive experiments delayed its development. Watt and Boulton battled against rival engineers such as Jonathan Hornblower, who tried to develop engines which did not fall afoul of their patents. Watt patented the application of the sun and planet gear to steam in 1781, and a steam locomotive in 1784, both of which have strong claims to have been invented by Murdoch. Murdoch never contested the patents, however, and remained an employee of Boulton and Watt for most of his life. Boulton and Watt's firm continued to use the sun and planet gear in their rotative engines long after the patent for the crank expired in 1794. James Watt's improved steam engine transformed the Newcomen engine, which had hardly changed for 50 years, into a source of power that transformed the world of work, and was the key innovation that brought forth the Industrial Revolution. A significant feature of Watt's invention was that it brought the engine out of the remote coal fields into factories, where many mechanics, engineers, and even tinkerers were exposed to its virtues and limitations. It was a platform for generations of inventors to improve. It was clear to many that higher pressures produced in improved boilers would make engines with greater efficiency, and would lead to the revolution in transportation that was soon embodied in the locomotive and the steamboat. The steam engine made possible the construction of new factories that, since they were not dependent on water power, could be placed almost anywhere and work year-round. Work was moved out of the cottages, resulting in economies of scale. Capital could work more efficiently, and manufacturing productivity greatly improved. New demand for precise machining produced a cascade of tools that could be used to produce better machines. In the realm of pure science, Watt's steam engine focused attention on the processes of converting heat to mechanical work. It inspired Sadi Carnot's groundbreaking paper on the efficiency of heat engines, which led to the development of the field of physics known as thermodynamics. The unit of power that Watt developed and adopted, the horsepower, is the power expended in lifting 33,000 pounds through one foot in one minute. The watt is an alternative unit of power named after James Watt. One horsepower is equivalent to 745.7 watts. 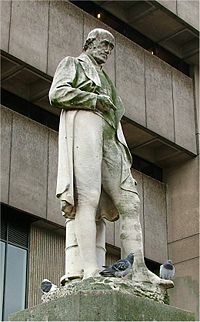 A statue of James Watt stands outside Birmingham Central Library. Watt was buried in the grounds of St. Mary's Church, Handsworth, in Birmingham. Later expansion of the church, over his grave, means that his tomb is now buried inside the church. A statue of Watt, Boulton, and Murdoch is in Birmingham. He is also remembered by the Moonstones and a school is named in his honor, all in Birmingham. There are over 50 roads or streets in the UK named after him. Many of his papers are in Birmingham Central Library. Matthew Boulton's home, Soho House, is now a museum, commemorating the work of both men. 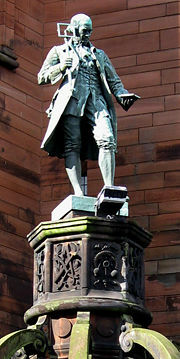 The location of James Watt's birth in Greenock is commemorated by a statue close to his birthplace. Several locations and street names in Greenock recall him, most notably the Watt Memorial Library, which was begun in 1816 with Watt's donation of scientific books, and developed as part of the Watt Institution by his son. The institution ultimately became the James Watt College. Taken over by the local authority in 1974, the library now also houses the local history collection and archives of Inverclyde, and is dominated by a large seated statue in the vestibule. Watt is additionally commemorated by statuary in George Square, Glasgow, and Princes Street, Edinburgh. The James Watt College has expanded from its original location to include campuses in Kilwinning (North Ayrshire), Finnart Street and The Waterfront in Greenock, and the Sports campus in Largs. The Heriot-Watt University near Edinburgh was at one time the "Watt Institution and School of Arts" named in his memory, then merged with George Heriot's Hospital for needy orphans and the name was changed to Heriot-Watt College. Dozens of university and college buildings (chiefly of science and technology) are named after him. The huge painting, James Watt Contemplating the Steam Engine, by James Eckford Lauder, is now owned by the National Gallery of Scotland. Watt was ranked first, tying with Edison, among 229 significant figures in the history of technology by Charles Murray's survey of historiometry presented in his book, Human Accomplishments. Watt was ranked 22nd in Michael H. Hart's list of the most influential figures in history. The SI unit of power, the "watt," is named after him. ↑ Although a number of otherwise reputable sources give his date of death as August 19, 1819, contemporary accounts report him dying on August 25 and being buried on September 2. 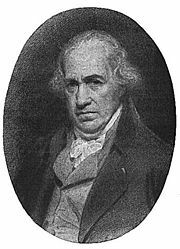 The date August 19 originates from the biography The Life of James Watt (1858) by James Patrick Muirhead. It draws its (supposed) legitimacy from the fact that Muirhead was a nephew of Watt and therefore should have been well-informed. In the Muirhead papers, the August 25 date is mentioned elsewhere. "Some Unpublished Letters of James Watt" in Journal of Institution of Mechanical Engineers. 1915. London. This page was last modified on 20 March 2018, at 16:39.